Explanation: Not all roses are red of course, but they can still be very pretty. 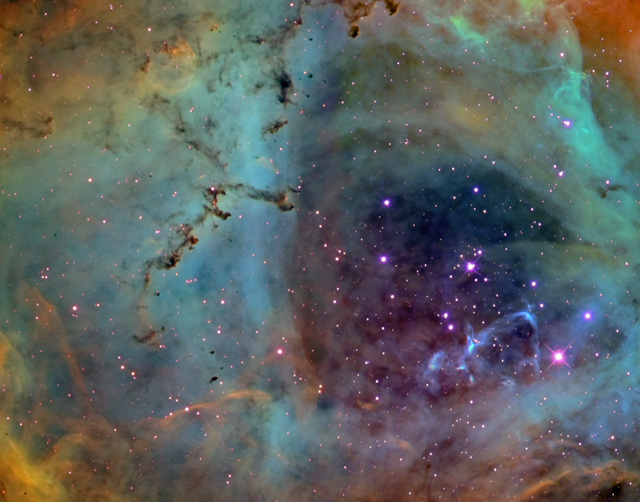 Likewise, the beautiful Rosette Nebula and other star forming regions are often shown in astronomical images with a predominately red hue - in part because the dominant emission in the nebula is from hydrogen atoms. Hydrogen's strongest optical emission line, known as H-alpha, is in the red region of the spectrum, but the beauty of an emission nebula need not be appreciated in red light alone. Other atoms in the nebula are also excited by energetic starlight and produce narrow emission lines as well. In this gorgeous view of the Rosette's central regions, narrow band images are combined to show emission from sulfur atoms in red, hydrogen in blue, and oxygen in green. In fact, the scheme of mapping these narrow atomic emission lines into broader colors is adopted in many Hubble images of stellar nurseries. This image spans about 50 light-years in the constellation Monoceros, at the 3,000 light-year estimated distance of the Rosette Nebula.